Amateur athlete and war tax resister Eroseanna Robinson, Chicago, Ill., refused to turn over records to the IRS and was sentenced to 12 months for contempt after a high-profile court case. However, her total refusal to cooperate and a persistent hunger strike forced authorities to release her on Mar. 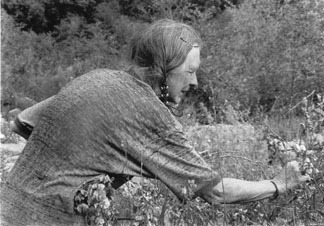 1, 1960, from Alderson, W.V., after serving only three months. 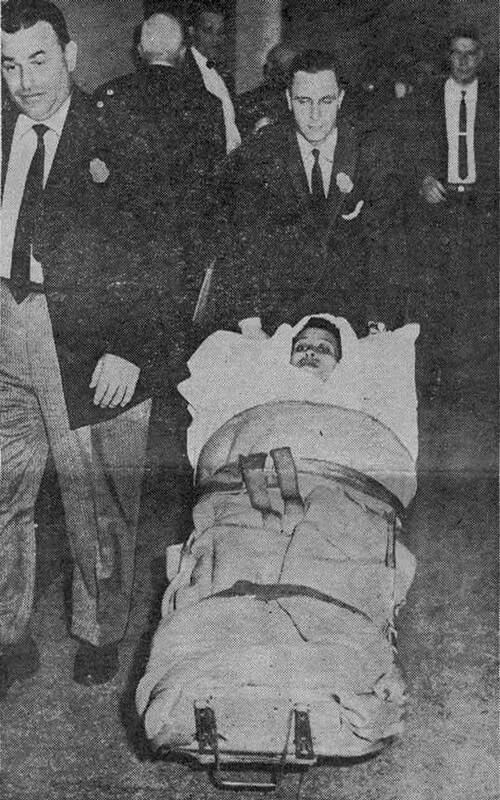 The photo (left) shows Robinson being taken to U.S. District Court on a stretcher because of her refusal to walk. Sentenced to be shot for refusing to go into the military during the first World War, Max Sandin, a war tax resister since 1942, staged a sit-in at the Treasury Dept. in Washington, DC, on Aug. 29, to protest the IRS seizure of his social security checks. He was arrested and taken to the hospital for a “sanity test,” which he passed and was eventually released after 13 days. Nevertheless, the IRS continued to seize his social security and painters’ union pension checks. 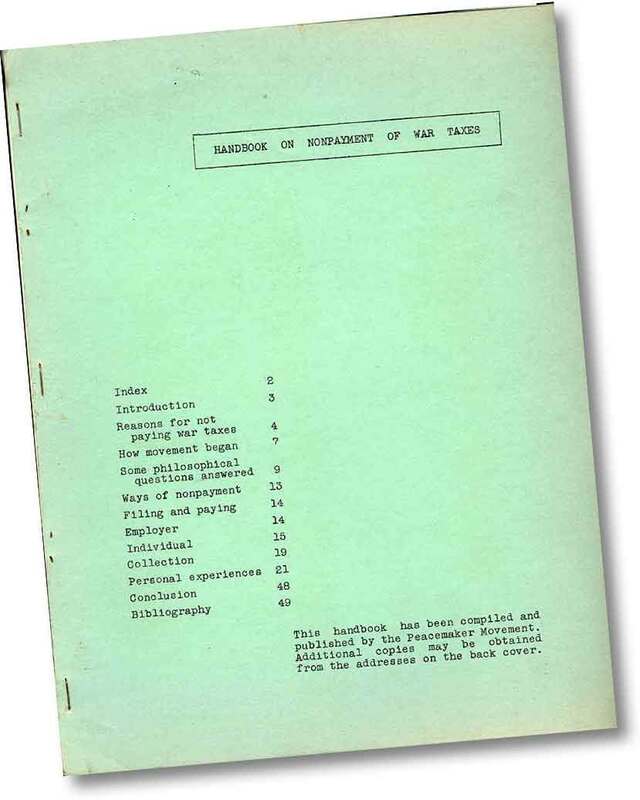 The first war tax refusal book, Handbook on Nonpayment of War Taxes , was published by the Peacemakers in 1963. Its fourth and last edition was published in 1991. Maurice McCrackin was removed from the ministry of the United Presbyterian Church for his refusal to pay war taxes. Denver physician and war tax resister Arthur Evans was sentenced to and served 3 months in Jefferson County Jail for refusing to turn over financial records to the IRS. 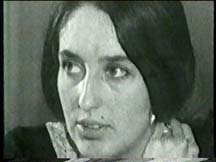 In April 1964, folk singer Joan Baez announced her refusal to pay 60% of her 1963 income taxes due to the Vietnam War. 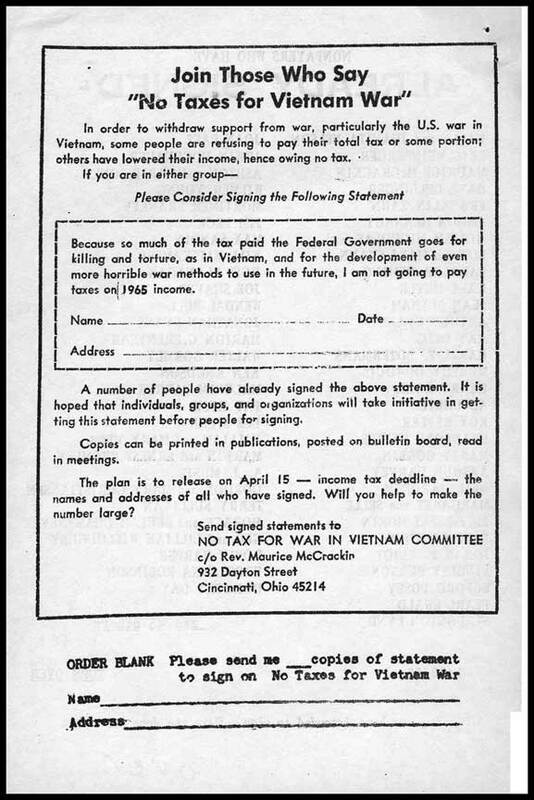 The Peacemakers began No Tax for War in Vietnam Committee and asked people to pledge, “I am not going to pay taxes on 1964 income.” The pledge was continued through 1967, eventually garnering about 500 signatures. 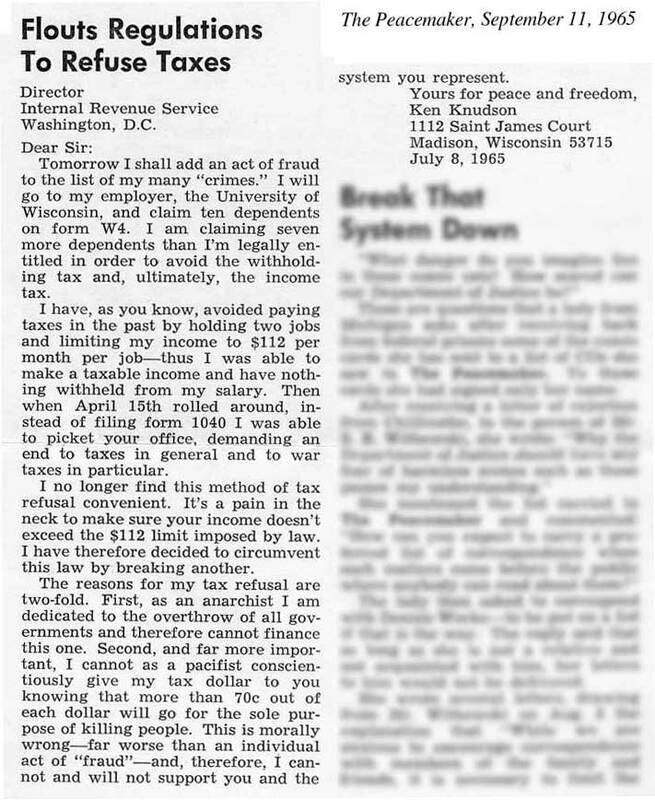 In a 1965 letter to the IRS (reprinted in The Peacemaker [left]) Ken Knudson suggested inflating the W-4 form to stop withholding. National promotion of this strategy by a number of peace organizations resulted in thousands joining the war tax resistance movement. Ultimately — between 1970 and 1973 — 17 people were indicted for claiming too many dependents, 11 were convicted, and 7 were jailed. For the full list of indicted resisters, see www.nwtrcc.org/convicted_wtr.php. On February 28, a petition was sent to the King Baudouin I asking him for a law allowing for conscientious objection to military taxation. The Tax Refusal Movement began as a protest to the first French atomic tests at Moruroa in the Pacific. A.J. 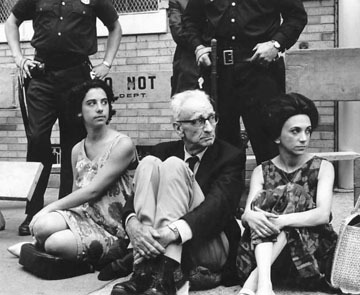 Muste (center) sitting in at the Atomic Energy Commission headquarters with Miriam Levine (left) and Judith Malina, 1963. A.J. Muste obtained 370 signatures for an ad in the Washington Post , proclaiming the signers’ intention not to pay at least a portion of the 1965 income taxes. Twelve village chiefs refused to cooperate with the Portuguese attempt to collect taxes. President Johnson asked Congress to reinstate a 10% telephone service excise tax to pay the expenses of deploying a half-million soldiers in Vietnam. 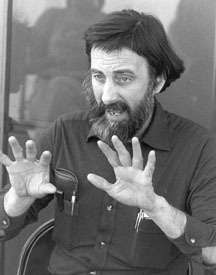 Karl Meyer, a Catholic Worker activist in Chicago, recognized the simplicity and directness of urging people to refuse a specific war tax, levied as part of one’s monthly phone bill. His “Hang Up on War” pamphlet was distributed by national peace groups and became the basis of a War Resisters League national campaign. Writers and Editors War Tax Protest was organized by Gerald Walker of The New York Times Magazine . 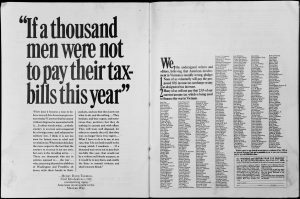 About 528 writers and editors pledged to refuse to pay the 10% Vietnam War tax surcharge. Only three publications — New York Post (Jan. 30, 1968), New York Review of Books (Feb. 15, 1968), and Ramparts magazine (Feb. 1968) — would allow the ad publicizing the effort to be published. The New York Times published an early article about the protest (click on image to the right) on Sept. 17, 1967. 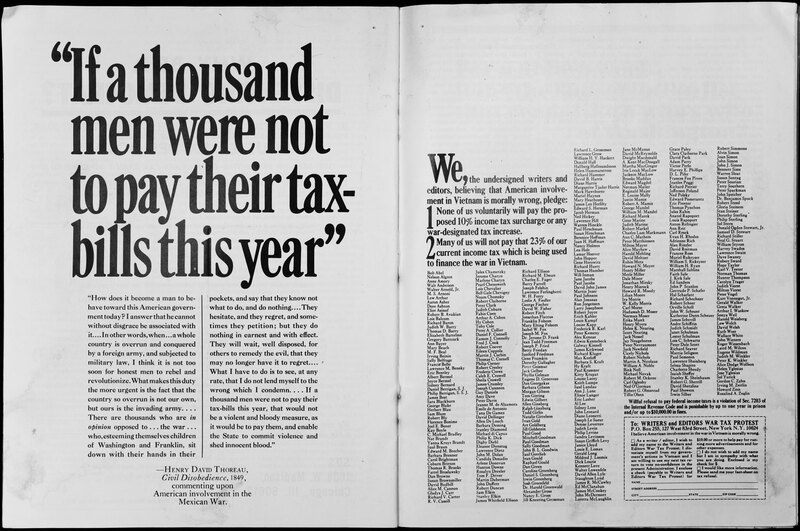 Writers and Editors War Tax ad as it appeared in 1968 Ramparts magazine. Click here for a list of names that appeared in the three ads. The telephone tax resistance case of Martha Tranquilli, Mound Bayou, Miss., led to a decision that telephone service may not be disconnected for nonpayment of federal tax. Also in 1968, printer and war tax resister Neil Haworth cited the First Amendment to the Constitution for refusing to turn over records to the IRS. He was found in contempt of court and sentenced to and served 60 days in Middlesex State Jail, Conn.
Because the War Resisters League could no longer handle the volume of requests regarding war tax resistance, National War Tax Resistance was formed. 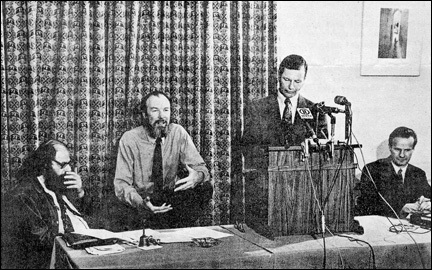 A press conference announcing the founding was held in New York City by Allen Ginsberg, Pete Seeger, Kennett Love, and Bradford Lyttle (pictured below). 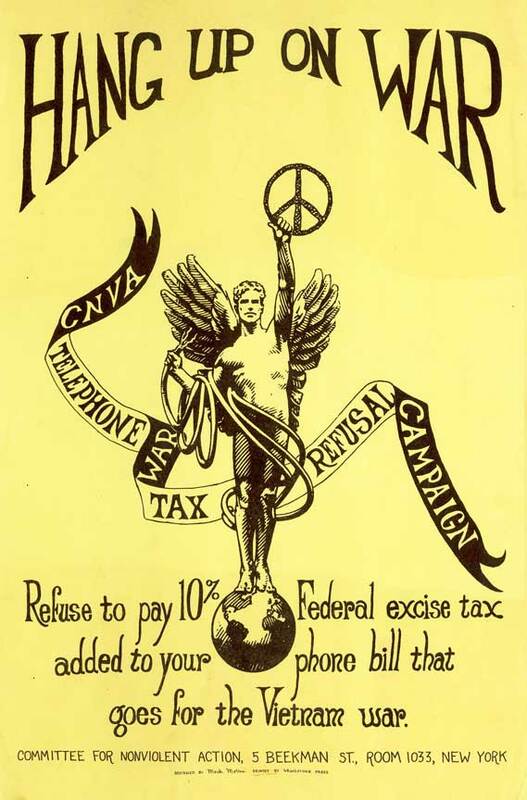 National WTR began publishing Tax Talk (a periodic roundup of news about war tax resisters), produced two editions of a WTR handbook, formed chapters around the country, and lasted until 1975. 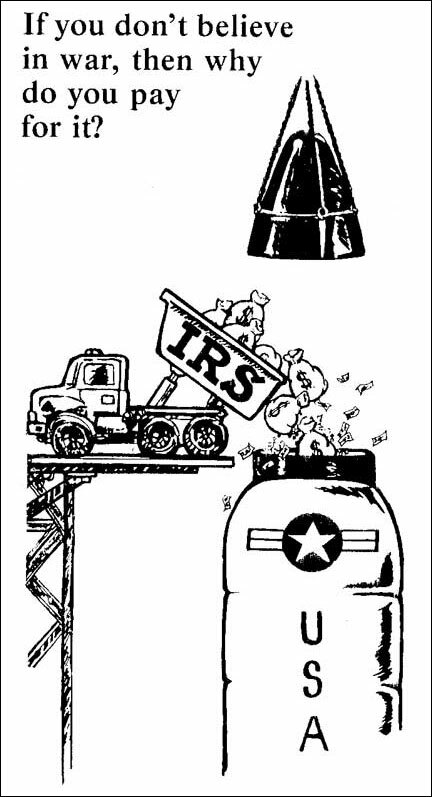 The New England War Tax Resistance Alternative Fund began.